One of the coolest things to come of our impending celebration renewal of vows (currently a week away) is the reminiscing. My flatmate from a semester I studied at the University of Calgary has taken a very rare break from her work to come down and join us for the party. After being stopped by the drug dog, interrogated for two hours, searched, and then finding out that it was actually the dude next to her that was carrying and she just kinda got caught in the crossfire, she arrived safe but shaken through our threshold a couple of days ago. She’ll be adventuring around the Auckland region with one of the many new friends she’s already made, and then heading out to the Eminem concert on Saturday night, before catching a plane to embark on a two day journey to get to Orlando Florida for a work gig. 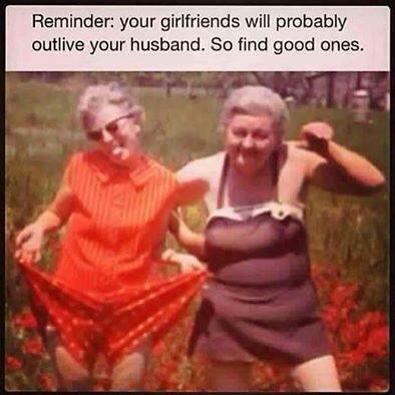 THAT is friendship. Also, probably more than just a little bit of foolishness. But then, if, I recall, as a team, we always did have a bit of a penchant for foolishness, so why would it wane after 15 years? 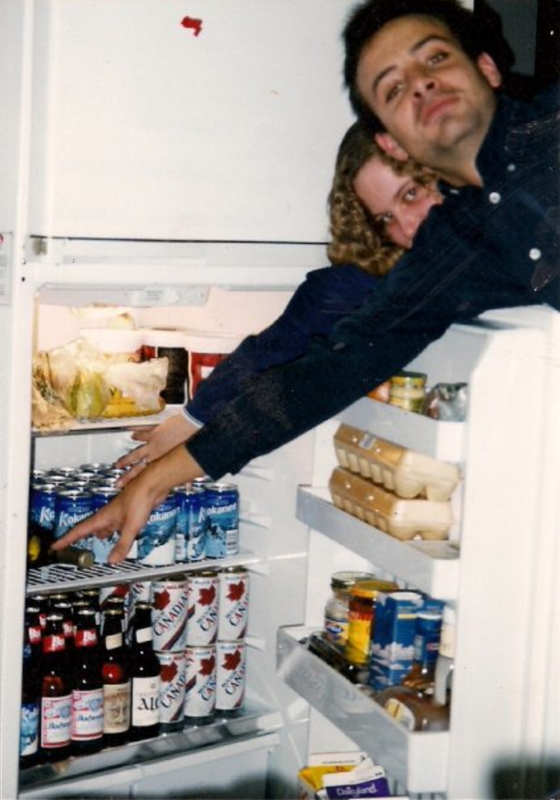 Here is a picture of our good friend Coen and Alie… and our fridge at University. NOTE: IF ANYONE ANYWHERE HAS SEEN THIS MAN, PLEASE LET US KNOW! We have scoured the Internet for our long lost Flying Dutchman friend, and it has turned up nothing so far. If you know him, tell him to get in touch with either Alie or myself! We’d LOVE to see him. For the past two days, the house has been full of friends, kids, and various visitors. We’re putting the finishing touches on the run sheets for the day, finalising menus, all that type of stuff. While I was off gallivanting in California last week, the bridesmaids and another friend (who is a stellar event manager) have spent hours on the phone and Internet organising EVERYTHING for the day. I’ve got no idea what I did to deserve friends and sisters like these, and even with my generally extensive verbosity, I just don’t have the words to tell them how much I Love and appreciate them, not just for what they’ve done for us recently, but for the years and years of support and ups and downs and all that they have been through and we have weathered together. So, part of the preparation seems to be a lot of trips down memory lane. Friends of mine are meeting for the first time, and sharing eerily similar stories about the things we got up to in days gone by. Oh my word, I have crammed a lot of adventures in over the past 35 years. The thing that has struck me though, is that I look back on the many foolish things I’ve done, and the time I spent in my youth, and it generally makes me sad. Talking to my friends about it over the past few days though, oh my… did we have some fun. So last night, we drove out to get some Kiwi fish and chips. My two friends shared stories about the fun we had and the mischief we got up to. I’ll spare you the gory details. We did have an amazing laugh about a Halloween party in Calgary where we hosted people from various nations and continents in our small res apartment. One of the Germans very loudly proclaiming “I have a bratwurst in my pants!” while our Newfie friend (dressed in completely politically incorrect garb) was yelling “Coen, COEN!” (pronounced K-oo-n) across the room to our flying Dutchman friend who was standing with the gorgeous social butterfly lad from Ghana. The hilarity of that night is easily fodder for one of the best comedy sketches that could ever be written, and we weren’t even trying to be funny or ironic. Just being young, foolish, insecure and enjoying our time together as we all knew that it was fleeting. 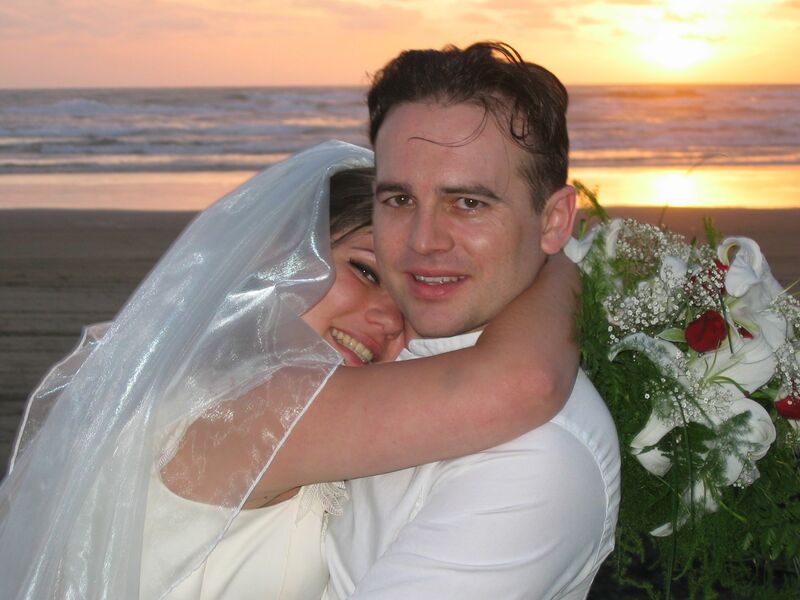 More than a decade on, I’m languishing in the rather sheltered existence of wedded bliss. I have a suitcase full of memories of the time before time when I was footloose and fancy-free. And the many varied paths my friends have taken, both getting and staying married, or single, breeding, or not breeding, traveling or building careers. I am enjoying learning vicariously about life as a single person from the friends who are out there in the dating trenches. It is quite mind-boggling how things are done in the digital age. It turns out a lot has changed since I was single, and there’s way more happening on dating scene in 2014. So being happily spoken for for more than a decade now means I have not been privy to the wonders of technology that are bringing people together in this digital age. When I was a young lass, I’d date people I ran into at work, school, or out socializing and courting and chaos would commence from there. It is no longer so simple. There are dozens of sites and apps for people to go to in order to find Love, or a romp, or anything at either extreme or in between. You can hook up with someone at a moment’s notice anywhere in the world, by swiping left or right on your smart phone. It just happens that my friends are not only quite attractive women, they are also charming and funny and therefore the object of more than a little bit of attention out there in the singles scene. And you know what happens to them with alarming frequency? Well. They get sent pictures of the male anatomy, that really ought to remain unseen in polite society, with no solicitation. Why I found this so fascinating I don’t know. It was also quite a shock to be faced with the fact I am so utterly out of the loop and, I guess, a bit of a prude. “What do you mean it happens ALL THE TIME?” I gasped upon hearing literally dozens of stories from my girlfriends. As a result of seeing these girls, we have been engaging in a lot of conversations about dating etiquette, then and now. I’m not sure if it is a testament to our age and the increased confidence that comes with being over 30, or if things are really genuinely changing, but as far as I can tell many women are gaining the upper hand in this dating dance. Dating today means there is no waiting for the man to make the first move. It is okay to say no, and it is absolutely okay to say yes as well. Being single is not a sin, and being separated and sowing wild oats does not make you a harlot or a social pariah. Strangely, my gorgeous guy friends who are recently back in the game are finding it much harder than the women, and in my small study sample, that seems to consistently be the case. All this talk of dating exposed my beloved Grumpy’s strangely chivalrous side. Despite being quite a cad in a lot of ways, the man I married is a gentleman and, quite genuinely, a fabulous feminist. Well. Colour me gushy, my gorgeous Grumpy feels genuine concern and protectiveness for the women we know, and also thinks it is about high time they had the option of being out there chasing a bit of tail of that’s all they want to do. Double standards be damned, but a lady should still be treated with dignity and respect, and she should certainly be showing the same level of regard for the hearts and minds of the men she dates. I am enormously and immeasurably thankful to NOT be out there in the trenches of the dating game. Regardless of the improved ease the online environment has given to participants wishing to engage in, well, anything you can imagine from what I gather. I’ve met my match. And as our friends have oft pointed out (rather coarsely at times) perhaps the only man on the planet who has what it takes to handle the fantastic tapestry of chaos, kindness, Love and confusion that is Dee. And vice versa. So all the best to those of you out there on the dating scene, and also to couples old and new that are toughing it out together in good times and bad. I Feel Him Rolling – I Ain’t Hating! I love seeing the world through your eyes Dee – as always an incredibly enjoyable read!